Gear up and get ready to click, because the Nike Easter Pack drops tomorrow 3/29 at 8AM eastern along with the AF1 Lunar and Hyperflight “Superhuman” or Superhero pack and Whiteout Foamposite. 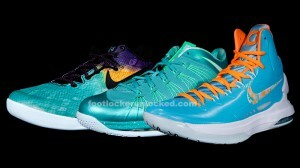 This pack includes the first LeBron X Low to hit shelves, as well as new signature colorways for the Kobe 8 System and KD V Premium. We will be posting quick links to buy them online tonight, so stay tuned. Nike Lunar Force 1 QS "Easter Hunt" Begins Saturday 3/30.